CP66 6W 8 ohm plastic bidirectional corridor speaker. Simple to install and suitable for many applications . 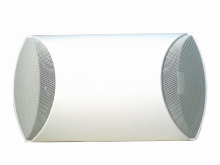 The speaker is ideal for public address and background music systems.